Amyatt Edmund Livesey, known as "Will", was born in 1909 at Stourton Hall, Horncastle in Lincolnshire. During his private schooling he studied in Shropshire and there are numerous cards sent to this address confirming "Will’s" passion for short wave listening. His elder brother of five years, Gerard, was also a keen radio enthusiast in the early 1920’s and he obtained the amateur radio callsign 2BZT (later G2BZT). However, this interest was less consistent throughout the ‘30’s as the lack of cards and records appear to confirm. There can be little doubt that the young "Will" would have received a great deal of support and encouragement form Gerard, and also Arthur Simonds, a fellow amateur who lived in the nearby town of Mablethorpe. From the dates on the QSL cards it was probably around 1928 that he obtained the callsign G6LI. Mention has already been made of how "Will" would have constructed his own equipment and it was probably as a direct result of this interest that at the age of nineteen he went on to study electrical engineering at Faraday House in London between 1928-1932. Amateur radio also played a fortuitous social role as it was while he was studying in London that he was invited to lodge with one of the most influential amateurs of the period and one who was to play an increasingly important role in the development of the RSGB and amateur radio, John Clarricoats, G6CL. In fact, according to information provided by "Will’s" widow, Audrey, it was as a direct result of "Will’s" suggestions that Clarricoats actually decided to take on a full-time role as an Officer at RSGB Headquarters. The rest, as they say, is history. Towards the end of his training, "Will" spent time with his industrial sponsors, Mess. Robey & Co., Ltd. in Lincoln. The high grades on his graduation diploma indicate just how competent an engineer he had become. In the mid1920’s he turned down an offer to work at Marconi, then the most prominent industrial firm in the development of radio and instead accepted a job with Western Electric as a sound engineer. It was during this time that rapid developments in filmmaking were taking place that eventually led to the production of the first sound film in 1929. There followed a period of work as a sound engineer on the film sets at the Denham Studios where "Will" worked alongside some of the greatest British film stars of the period before he eventually moved back to his family home in Ludborough, Lincolnshire. Cinemas were numerous and very popular in the period between the wars and "Will", still working for Western Electric, was contracted to service the sound systems of many of the cinemas in Grimsby and the surrounding area. He travelled extensively around the district, servicing each cinema that used the Westrex Sound System. It was during the course of one of these regular visits that he met his future wife, Audrey. They married in 1941 and eventually had two children, Christopher and Josephine. During the war years "Will" was enlisted as a special listener. At the outbreak of war all radio amateurs were instructed to close down their stations. This was further enforced by the Post Office who sent representatives to the home of every amateur to collect all the transmitting and listening equipment. Remembering that the country had a valuable resource of people who were trained in radio theory and operating techniques, a number of amateurs were enlisted to listen on the frequencies of known enemy units or to record the radio traffic between clandestine operators operating behind enemy lines. "Will" was recruited as part of this specialist team (SCU4) and was required to listen for two hours in the morning and two hours in the evening receiving and recording five figure groups of information that was then dispatched for deciphering. But this was not as easy as it sounds as these operators, knowing that their transmissions were being intercepted, regularly switched frequencies and changed callsigns. However, radio amateurs were practiced in the art of reading Morse code and skilled operators were able to identify the particular sending characteristics of individual operators. It is precisely this type of information that would have been required by the scientists at Bletchley Park while they were breaking the German Enigma code. "Will’s" amateur radio activities throughout the late 1920’s until the late ‘50’s were extensive. He was a regular participant in the British Empire Radio Union (BERU) series of contests and won numerous certificates for his achievements from the1930’s onwards. 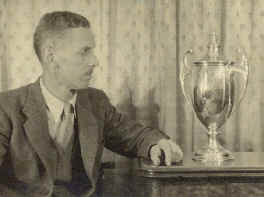 In 1953 he was awarded the Wortley-Talbot Trophy for outstanding experimental work with amateur radio. I believe that this was in recognition for his work on the VHF amateur band of 2 Metres (144MHz). It was around the mid 1950’s that my father recalls meeting with "Will" on several occasions, as he was then chief projectionist at the Rialto cinema in Grimsby. "Will", of course, serviced the cinema’s sound system. He remembers "Will" as a gentle, well mannered, quietly spoken and highly knowledgeable person. However, the impact of television was having a dramatic affect on the numbers of people attending cinemas on a regular basis. A large number were either closing or changing into Bingo Halls, an enterprise that was far more lucrative financially. Eventually, in 1961, he was made redundant. Not surprisingly, my father experienced the same fate at about the same time. "Will" went on to work for the Yorkshire Electricity Board as a consultant engineer until his retirement in 1974. He lived a peaceful retirement until his death in 1991 at the family home in Ludborough. I find it somehow appropriate that it was my father who came across "Will’s" old cards, quite by chance, nearly fifty year’s later. I am rather sad that "Will" had grown tired of his radio operations by the mid 1960’s. His passion for radio had been of enormous importance throughout his life and he had achieved so much and had been in the vanguard of technical progress. Indeed, it was probably because he had achieved so much over so many years that the activity seemingly held no new challenges for him. A number of his older amateur colleagues had by then died and he was also somewhat disillusioned by the growing number of television sets that caused interference to his receiver (and vice-versa). Ironically, it was during this time when "Will’s" interest was waning that I was becoming interested in radio. It was also during this period that commercially manufactured equipment was being widely advertised. Radio amateurs new to the hobby were no longer required to construct their own equipment, although many did and still do so today. A growing number also used ex-military equipment, a great deal of which had become available after the war. I often wonder what "Will" would have thought about the vast range of equipment available to amateurs today, with microchip controlled functions, surface-mount components, ultra-low noise receivers and high power solid state devices operating up to ultra-high frequencies. I’m sure that the long distances worked on VHF on an almost daily basis would impress him. Perhaps he would be fascinated and marvel at the technology, but I fear that he would be saddened by the modern day amateurs’ inability to fully understand just precisely what does goes on inside the modern day commercial "black boxes". But times have changed. In "Will’s" heyday, he was able to keep pace with technology in a way that has not been possible since the advent of the integrated circuit. Increasing commercial pressures have demanded a wider range of domestic electronic consumer goods and the spin-offs from these advances have gradually filtered into the amateur market. There are challenges in the art of radio communication that are still as great as in G6LI’s golden period between the wars. These include communication via satellites, bouncing signals off the moon and meteor particles, communicating on microwave and very low frequencies, computer generated digital modes and working with low power equipment. The art of making homemade equipment is still alive and well. Aerials in particular, always the weakest link in any amateur station still provide a lasting impetus for the self-training of the enthusiast. The thrill of making contact with another station on the opposite side of the world is still as exciting today as it ever was.